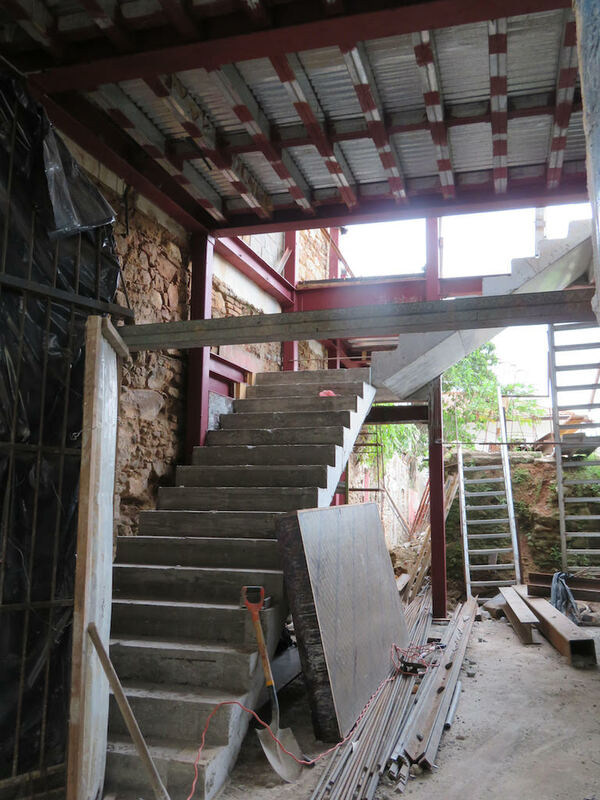 Spanish Colonial renovation in Casco Viejo (Panama City), Panama from our trip in January. Almost entire district is under intense restoration. One of the fun things we've been doing this summer is working on a remodeling project with some friends. They have a large shed in their yard that's been neglected and leaking for years and together we're transforming it into a creative space. It's been fun to gather once a week and have a day of chatting, demolishing, reconstructing, considering and seeing something new and exciting come out of the old shell. It's years since Shawn and I have remodeled anything. While this undertaking is a strictly "for fun" project rather than work, it brings back memories of our previous projects and a chance to compare and contrast them. Our first remodeling project was in a condo and almost doesn't count. We were so green around the gills that one of our most hilarious memories of that project involves doing work on the bathroom plumbing without turning off the water first, thus creating a fully functioning indoor replica of Old Faithful. Our real trial and learning process came on our first home, which turned out to be a rat infested shambles and had to be stripped to the bones before coming back as, in many ways still, our favorite house. Remodeling can be a great project to undertake if you are unable to secure a lot loan or building loan, which typically carry higher interest rates and can be difficult to get in the first place. Remodeling can also be an ideal choice if you live in a place where fixer uppers are reasonably priced to start with. When we acquired our first one, it was what we could afford. Houses in the Seattle area, even back at the "turn of the century" were out of our reach and Point Roberts, where we came, had lots of houses with good bones at rock bottom prices (though at the time, they didn't seem so rock bottom to our youthful budget!). We had dreamed of building, but hadn't done our research into the financial prerequisites of the process, so a renovation was ideal for us. Nowadays, even in our little town, the cost for a remodel is more prohibitive given the amount of work that can be required. The cost of labor has gone up a lot as the building trades have become busier all around. If you are doing all the work yourself, out of desire or necessity, as we were, this may not be a hindrance. But if you are working full time and need to hire out most of the work, you might want to keep that in mind. Bear in mind too that if you are not (yet) experienced, things will take longer than you expect. Frankly, we've got a pretty solid background in many aspects of the building process and things STILL take longer than expected! Remodeling jobs are notorious for uncovering more than you expect to find. While you might start out the demolition work for the day with the intention of having the drywall back up by evening and doing the mudding and patch work the next day, who knows what you'll find when the job gets started! A leak, a wiring fault, wood that needs shoring up or replacing...these are all typical things that almost anyone tackling renovation work of any scale will tell you they encounter all the time. So keep time and expenses on your list of things to be aware of. Another thing to keep in mind...along with remodels not necessarily being cheap to start, you may also encounter additional work and expense in terms of bringing your remodeling project up to speed with current code conditions. This may not be an issue in your particular jurisdiction, as counties, cities and towns all over the country take a variety of approaches to implementing code, so be sure to check into it. You may also want to keep in mind that if you intend to sell the property again at some point, you may be required to obtain required permits, have inspections performed along the way and get a final stamp from your building department showing the job was completed to current requirements. I mention this because in one place the we lived, people wanting to put their house of 20 years on the market keenly rued never getting their final building permit when they undertook their building project. In order to sell the home, they needed a final inspection on file - and now, they were required to meet not the code of 20 years back, but current code! You can imagine the language emanating from the mouth of the recipient of that unfortunate bit of information. What are the pros of the remodeling undertaking? I have always liked that the property might have a more settled appearance...such a lot of work goes into excavating a fresh piece of land...clearing, digging, backfilling...it can take a long time for landscaping to get the lived in look of an extant property. If you can get the property at a good price, you might have the option of inheriting a nice lot of piece of land this way...in my experience - we have entered the age where the best is already taken and much of what we are building on today isn't the most choice (in terms of slope, sun, drainage and other factors). So a remodel could really let you buy a nice spot. If you are wanting a certain location, it might be your only option, as well. I'm thinking of urban areas, for example, where there may be no empty lots available. In this case, you might still be able to build from scratch if you were willing to buy a property and demolish it. There's expense involved there, but if budget isn't an issue or your budget covers those factors adequately, it can be a good option to remodeling. I have heard some interesting comments from people who wanted to remodel but found that they could build more cheaply and better by starting from scratch. Don't underestimate this as being applicable to your situation. In general, my feeling is that starting from the ground up is almost always better. Not always, but almost always. Here are some simple reasons why. First and foremost is that you can build a better house - one up to current codes and beyond in terms of energy efficiency, window technology. Plus, you can design to meet your specific needs rather than attempt to bend an extant property to your wishes...A well designed and built home can last you many many years with no surprises or further uncovering of weird wiring, wonky plumbing or any other disasters in the wings (or walls, as the case may be). Your remodel might include none of those things, but it is easier to build mold resistant structures from the start, for example, than to try and effectively rid of home of it after the fact. While most remodeling programs emphasize uncovering fantastic old moldings, tin ceilings, or nearly mint Douglas Fir strip flooring with amazing inlay during the course of renovations, they perhaps should also focus on revelations like mold issues, moisture damage, wiring faults and slipshod plumbing hacks undertaken by the previous owners. Those are far less exciting, but far more likely to be uncovered than a frescoed ceiling. Take it from me! Not only did we uncover a particle board subfloor when we pulled up the hideous blue and green shag carpet from our remodel, but we also found that a sink had been leaking from the adjoining room for at least a decade, spreading rot in all directions. This necessitated not just sealing the particle board with a sturdy primer throughout as we had hoped, but getting roofing demolition shovels from a contractor friend and tearing out every last inch of the miserable stuff. Talk about fun. It is important to look at a potential project with an eye unbiased enough to assess it for what it is. Looking under the house you are considering is more important than checking out the street view. It may disabuse you of false notions of how wonderful a potential property is, as well. Or let you know how something that looks utterly horrible might really be a good candidate for a remodel. It's amazing how a sow's ear can be turned into a silk purse, and my warnings to the contrary are not meant to say that this can't be the outcome. Those are just some random thoughts on the process of remodeling in comparison with building from scratch. I will also be the first to tell you that building or rebuilding anything at all, comes with varying interactions with despair and elation. It's a rewarding but challenging process that teaches much, sometimes gently and sometimes unforgettably. Give your choice some thought, as the right decision is made when you have fully considered your options, needs, wishes and budget. If you cover all those bases, you'll be making the right decision, no matter the bumps in the road.